US President Donald Trump, after recent skeptical statements about the role of world gendarme for America, suddenly sent an American military contingent to Central Africa. Ground forces and combat aircraft were sent to Gabon to protect American citizens in another African country - the Democratic Republic of the Congo. Why is America so worried about the situation in these states and why are they so important to Washington? The head of the White House, Donald Trump, notified the House of Representatives of the United States Congress the day before that, by his decision, troops had been sent to Gabon. 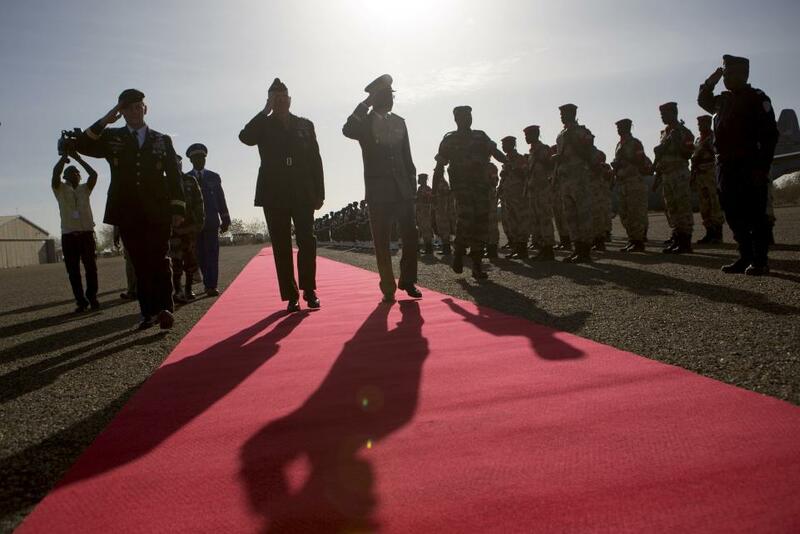 The limited contingent was redeployed to Libreville on 2 January. The goal, according to Trump, is to ensure the safety of citizens, as well as US diplomatic facilities and their personnel in the Democratic Republic of the Congo due to instability in this country against the backdrop of the past presidential elections. If necessary, American troops will cross the border of the DRC and begin to perform security and rescue missions there. At the same time, if necessary, additional US military forces may be sent to Gabon, the Republic of the Congo and the DR Congo itself. Africa is a continent of great distances. Therefore, the transfer of troops closer to the potential focus of the conflict will avoid the repetition of tragedies similar to those that occurred in Benghazi (Libya), where in 2012 the American consulate was attacked. In the Congo is extremely troubled situation. For two years, they could not hold elections there, because the current president did not want to leave and give up power. This, of course, causes destabilization in the country. Since 2001, the country is ruled by Joseph Kabila, who initially served as president, and in 2006 was officially elected to this post. He stayed in this position for two terms (five years each), after which a presidential election was to be held in 2016, in which Kabila, according to the constitution, could no longer participate. However, the vote was postponed indefinitely due to the inability to ensure adequate counting of votes and other organizational issues, as well as due to the outbreak of Ebola, the complicated crime situation in the country and the military situation (20 years since the Second Congolese War - is the UN peacekeeping force). The West and first of all the USA did not like this situation. Since 2017, Washington has repeatedly imposed sanctions against the Congolese president and his entourage. The latest sanctions ultimatum was put by the Americans Kabila in the summer of 2018 - the requirement was to hold elections before August 8. However, the vote was appointed only on December 23. But even here a whole chain of unexpected incidents prevented his conduct. The key was that the election bulletins and protocols could not be delivered on time. However, this was preceded by a fire at the warehouse of the election commission, which destroyed a significant part of the voting equipment, as well as the crash at Kinshasa An-26 carrying such devices. Ultimately, the elections took place on December 30, 2018. But, oddly enough, not across the country - in three major cities (Beni, Butembo and Yumbu), the vote was postponed to March 2019. Moreover, the DRC electoral commission cannot count the election results - their announcement was officially scheduled for January 6, but the commission does not rule out that it may take more time to process all ballots and protocols. In this case, the elections were accompanied by unrest in the country. The authorities of the DRC have already blamed the Catholic organization “The National Episcopal Conference of the Congo” for their warm-up, calling for the soonest announced name of the winner of the presidential race. In addition, the French radio station Radio France Internationale, which is one of the most popular in the DRC, was disconnected from the broadcast on charges of violating electoral legislation and provoking the population to mass actions. Also, the Congolese authorities ordered to disconnect access to the Internet throughout the country for an indefinite period and have already blocked the sending of SMS messages to residents. And the whole situation has disturbed the United States so much that they decided not just to declare violation of the principles of democracy and impose sanctions, but to send troops. At the same time, if the situation with the democratic processes in the DRC is really ambiguous, then the threat to the safety of American citizens and diplomatic missions in the country remains a mystery. Why did the Americans need to deploy troops? The fact is that they are aiming to push a candidate loyal to them to Kabila’s place and fear that they will not be able to do this. The election campaign of opposition candidate Felix Tshiskedi is led and sponsored by the United States. And another oppositionist, Martin Fayulu, is a former manager of the American company Exxon Mobil. Nevertheless, the greatest chances of victory still remain with the successor to the current president, Emanuel Ramazani Shadar. Americans have always been interested in this country. They were the first in 1960 to develop variants of the assassination of Patrice Lumumba in order to stop the "communist invasion" in Africa. Now there were elections for which Kabila put his puppet, and still do not publish the results. The situation in the DRC is very complex and continues to escalate. Congo is very important in terms of its mineral resources, which are necessary for modern American technology. The DRC accounts for 80% of all world reserves of coltan, from which tantalum is mined. Not to mention other riches - silver, gold, diamonds, cobalt, molybdenum. We should not forget also that the first American nuclear bombs were created on the basis of uranium, which they received from the territory of present-day Gabon and the DRC. In this situation, the United States, of course, would like to ensure its influence by being present in this region of the African continent. The black continent is again in the center of attention of the economically developed countries of Europe and Asia, as well as the USA, the expert stressed. It attracts with its mineral resources and, of course, very cheap human resources. The current actions of the United States are part of the division of Africa. Now China is actively rising in all directions - from the Arctic and Antarctica to the African continent - everywhere the Chinese have a deal. Everywhere they are in a hurry to be present, they are buying up what they can buy, they are influencing what they can influence. And this is unnerving the United States. This is also one of the factors that causes the United States not to be idle. Another important question remains, why did the Americans send troops not into the DRC itself, but into Gabon, which is generally separated from it by the territory of the Republic of Congo. That is, the matter is not only in the simple approximation of the positions of their troops to the center of a potential conflict. If we act by direct invasion, today it may already cause some concern and outrage among the world community. Besides, it’s not just in the Congo’s case, but it’s about ensuring control over the region, there are a lot of problems there now. And in Sudan, I would like the US to destabilize the situation, not everything is good with the elections in Madagascar, there is a struggle going on there. In Gabon itself, the situation is now also very ambiguous and unstable due to the serious illness of the current President, Ali Bin Bongo Ondimba. The opposition, which is very strong there and is headed by former foreign minister Jean Ping, has naturally intensified. But Gabon is one of the richest countries in Africa, which was previously also quite stable, unlike its neighbors. It is simply impossible for Americans to surrender such a country with large reserves of oil, valuable wood, manganese. There it does not mean that the opposition will take anti-Western positions, but it may take more nationalistic positions - there is no doubt about that.